Riverdale cast members appear in a new gallery of images from The CW. Because you can’t have too many Riverdale cast galleries… there have already been several, which you can find here on KSiteTV…. The CW has now given wide release to yet another gallery of photos spotlighting the attractive cast of their Thursday night show which features characters based on the ones from Archie Comics. We still won’t find out who killed Jason Blossom from looking at the pics, but there are certainly good photos within. 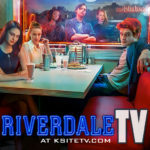 Included in the gallery are KJ Apa (Archie), Cole Sprouse (Jughead), Lili Reinhart (Betty), Camila Mendes (Veronica), Ashleigh Murray (Josie), Madelaine Petsch (Cheryl), Casey Cott (Kevin Keller… can’t say Kevin without the Keller, son of Sheriff Killer), Madchen Amick (Alice), Luke Perry (Fred), and Marisol Nichols (Hermione). Enjoy! RELATED: Check out KSiteTV’s Riverdale interview videos!